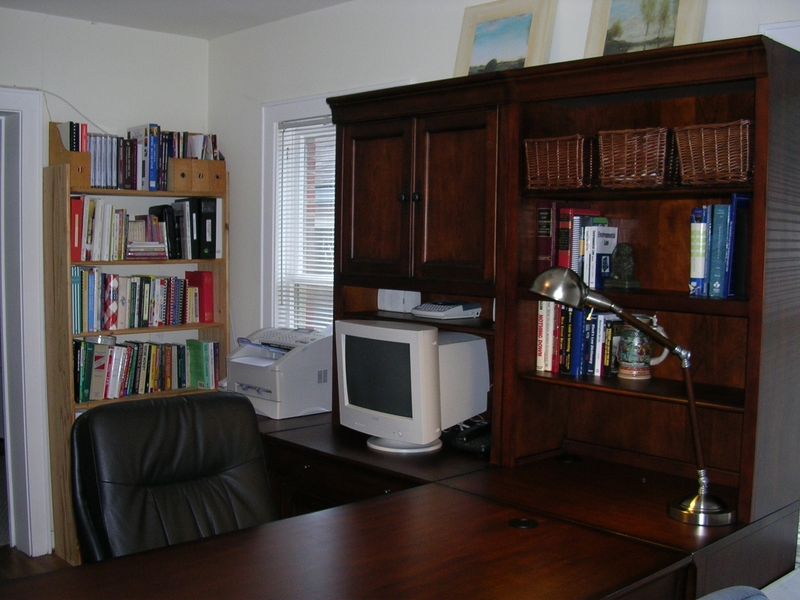 Organizing your home office, whether it is for personal or business reasons, makes all the difference! Getting down to business at your desk is a chore if it is piled with papers! Establishing a comfortable area for paper work and other office activities is important for productivity. Use these tips to create a space dedicated to effectiveness, efficiency and organization. As you begin, determine what tasks you are doing in your office and the tools needed for these tasks. By making these decisions at the outset, you are preparing your space for accomplishment. Create areas specifically designated for most frequent activities. As for room arrangement, place your desk in a position that allows maximum use of natural light. Position the desk in a direction that allows for direct viewing of all who enter without you having to turn. Add an L shape or credenza behind for easy access storage for your command center or project files. Desk drawers should have only what you use at the desk in them. Store your additional office supplies in another area. Keep specific categories of items individually stored in different drawers. One drawer should contain checks and bill paying items, one drawer stationary and note pads, one drawer with a pencil tray holding pencils, pens, tape, stapler and scissors. Again, keep just enough to use and not over stuff the drawers. Place books on book shelves, magazines or reading material in a basket to grab and go. Be sure that your telephone, computer and other essentials are placed easily in reach. A “paper plan” is most important in this work zone. Create an area for “Action” files. This is a temporary home where papers live until either filed away or thrown away. Papers used frequently or that are a “hot topic” need a basket, vertical file, or other space on your desk. Label them according to what actions or terms fit best with your needs. These files can be call, file, mail, or pay. Or these can be named by client name, project name, or other key word that comes to mind quickly. Clearly label your files so you will always know what is in them, and just as importantly, the labels will remind you what not to put in them. Arrange for the placement of frequently used files to be placed in the desk’s file drawer. Less frequently accessed files can be placed in a separate filing cabinet. As for filing cabinets, use a low-lying, two-drawer cabinet that can be placed next to or near your desk for the added use of its top for other items that you often need. Filing system should be simple easy and manageable. Create categories in your files for the different major work/home areas. For work it may be clients, administrative, financial. For home it may be home/auto, personal, and financial. Use general key words that come to mind quickly, and sub categorize as needed. An example would be Car – insurance, Car – maintenance, or Insurance – Car, Insurance – Home. Think about how YOU think about the paper to find it. Color-coding your files makes it faster to find information. Use one color hanging file to easily slip information into a file. Label the file with a tab using a label maker! Is there such a thing a work life balance? Does balance mean the “scales” are always even? Work life balance can be seen as always a work in progress, arms of the scale going up and down in small increments, but mainly toward the middle where balance occurs. In pilates, balance occurs when you are moving many parts in very small ways to keep the momentum of balance in place. That is really what our lives appear to be when we are balancing home, work, relationships, wellness, spirituality and community. How do we get this momentum of balance together? Work life balance comes together when you are strategic about your goals and your plan. Know what your goal of the balance is. It can be many different aspects of your life, but not every aspect. It could be to be healthier, “me” time, career advancement, contributing to the community, deeper relationships or peace of mind. Choose three areas you can positively change to add to your balance. Then think through your elements to keep them in balance. Then here are my six elements of balance. You can do it all, not all at once. Again, it comes down to choices. Put in the big rocks first. do the most important first in your day. Plan your work and work your plan. Have great tools like a planner and task list, have a weekly meeting with yourself and keep a task list for every day to keep focused. Build a team using everyone’s strengths. Learn to delegate waht you don’t do well. Power periods and productivity. Be in the moment, set up power periods in your day for productivity and be brutal about disruptions. Put your own oxygen mask on first. Have time in every week to rejuvenate and take care of your health in exercising, relationships, proper sleep and good eating habits. Decide on actions that fulfill these elements and position them in your calendar as “sacred” and unchangeable. 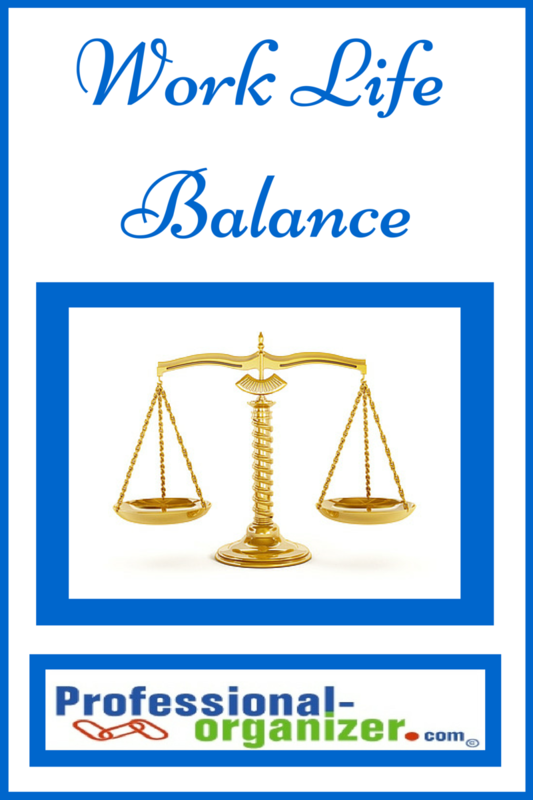 You have established a boundary for the really important aspects of your balance, and have flexibility on the rest. You have to know that your goal is and aim at this with specific actions, not generalities. Having specific times these actions are set, you can now work around them. It comes down to plan your work, and work your plan! Tough to do? Knowing what is most important to me, I find really makes the difference. If being a great mom is most important, drill down and decide what 3 actions show this. If being top in your field is most important, you must decide what 3 things establish this criteria for you. If it is both, let’s create a balance between considering the actions. I think of it as a road map, getting you to where you want to be. Work life balance for me means a full schedule of clients, time with my grand kids, time to exercise and time with my husband. I work with clients in blocks of time throughout the week, including Saturday. On Friday is my “Gigi” day where I pick up my grand daughter from school. Each week I schedule pilates, and then walk with a friend 3 times a week on a flexible schedule. Dinner time each night is my time together with my husband, but it can happen anytime between 6 and 8 pm. Everything else I work around these 3 aspects of what I consider the most important parts of my week. I see clients around the schedule, accomplish tasks at home including paper work, and take personal care with a good bedtime and focus on healthy eating. Find your work life balance with this equation and share with us what made the difference for you! Using an “organizer’s eye”, there is often space in a home, closet or office that is unused. Vertical space can be a great asset for organization. Use a section off your kitchen as an office nook with calendar, bulletin board and wall pockets for information. Use a narrow bookshelf with baskets at your back door to keep all the last minute items you need. Use a mud room installation at your entry for backpacks and shoes. Use hanging canvas organizer in your closet with plastic bins to hold lingerie, pajamas, and socks. Use decorative hooks on a wall to hold hats. Use clear push pins near the bathroom mirror to hold jewelry. Use a wall pocket just inside your office door to hold unprocessed papers before cluttering your desk. Use a dry erase board to list projects at your office. What clever uses of vertical space do you use? Our kitchens are the heart of the home! We want to nurture and communicate with our families, have dinner together, and make this hub of activity more efficient and less cluttered. Take a simple, step by step approach to making this space more effective. Kitchen organizing makes family life more cohesive, less stressful and more fun! Pare down to what you need by assessing what is in each drawer and in each cabinet. Keep the multi-function tools and donate the single use tools. Do this in baby steps, just drawer by drawer. Arrange your kitchen tools by use. Keep food preparation items near the sink, food storage items near the refrigerator, cooking items near the stove, and plates and glasses near the dishwasher for easy retrieval and storage. Be brutal about your food storage containers. Keep all the rectangular containers nested together with the lids nested in a separate container and then the circular containers nested together with the lids nested in their own container. Group small appliances together for easy access and improved storage. Assess when was the last time you used your bread maker or waffle iron and donate these if it is a while ago. 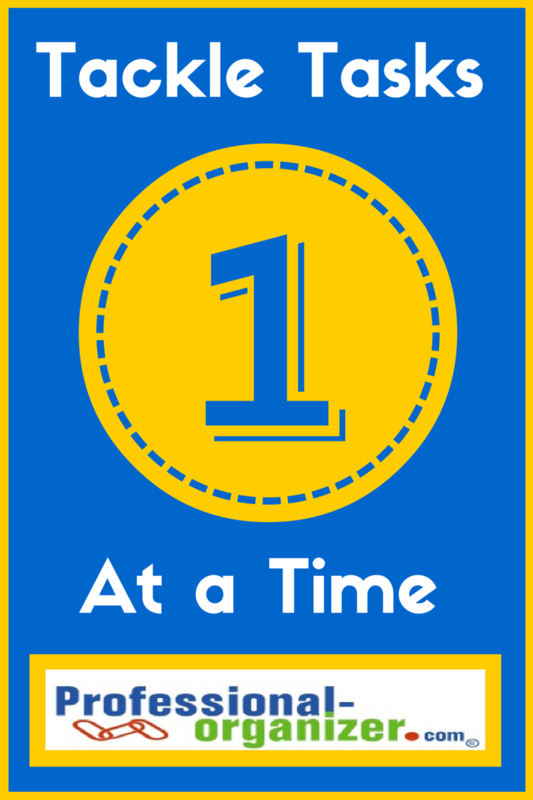 Establish work zones for frequent tasks. A lunch zone is great for getting your kids’ lunches together, including sacks, Ziplocs, and snacks that go into the bag. A coffee zone for the morning java might include coffee pot, coffee filters, mugs, and sweetener. Your “command center” for paper keeps piles from forming. Use a desk top sorter with hanging files for categories such as Action, Pay, File, and then one slot for each of your kids and husband or wife. Drop paper in when it arrives and then take an hour once a week for administrative tasks. Add a calendar space for your family calendar. Be sure to hang this where everyone sees it regularly and add information during your family meeting to keep it up to date. Review the expiration date of food in your pantry. Set up the “grocery store” on the shelves and put a label where food goes. 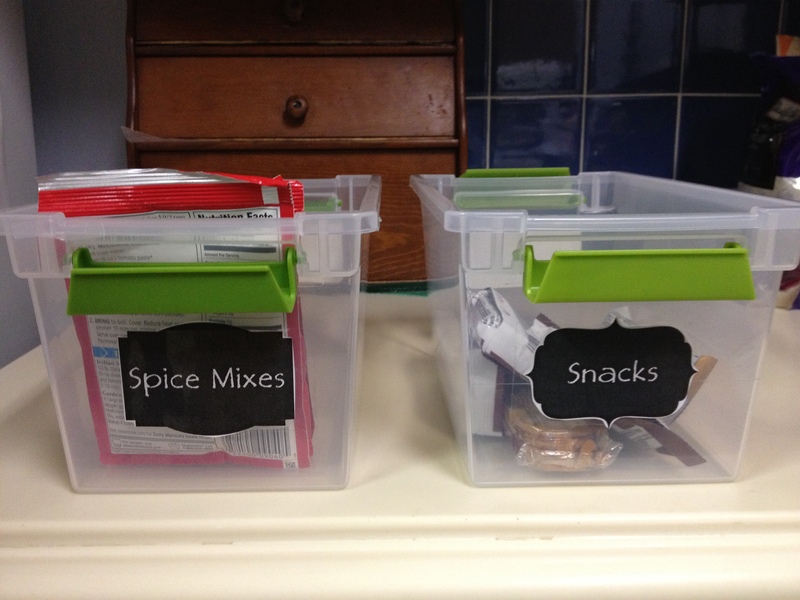 Remember to keep a section for healthy snacks for your kids to easily grab and go. All the experts agree, it takes time for change to happen. It can be from 30 to 60 days to create a habit or develop a routine. So take it in baby steps. Start with awareness of what small change will make the biggest difference. And remember, multi-tasking sets you back. Tackle tasks one at a time. Building in extra minutes to every task. Staying mindful and being in the moment on whatever the task is. Finding a partner for every task to help you with accountability. Using a timer to get you started and get you finished on your task. Setting out a sign that signals a productivity period to keep unwanted distractions away. What do you do to tackle one task at a time? To learn more about organizing, visit www.professional-organizer.com. To learn more about interior decorating, visit www.lesliesarmiento.com. Join us on Facebook at Professional-Organizer.com or Leslies Interiors. Kingwood professional organizer Ellen Delap and her company Professional – Organizer.com will be participating in this year’s Dress For Success Houston’s S.O.S. (Send One Suit) Drive. The effort, formerly known as Clean Out Your Closet Week, provides interview suits, confidence boosts and career development to more than 45,000 women in over 75 cities each year. Dress for Success is a not-for-profit organization that helps low-income women make tailored transitions into the workforce. Each Dress for Success client receives one suit when she has a job interview and a second suit when she gets the job. If you would like to contribute, please bring your interview appropriate suit in excellent condition, cleaned, pressed and on a hanger to Kingwood Country Club on March 8, 2011 from 5:00 – 6:30 p.m. Don’t have suit to donate? Dress For Success Houston suggests donating $75 toward the cost of a suit for clients over size 14. Receipts for donations will be sent directly by Dress For Success Houston. For more information call 281-360-3928 or email edelap@professional-organizer.com. I have my suit already chosen to donate! Do you?